CELT invited faculty to Coffee & Conversation on November 20. Topic: The Graphic Syllabus. 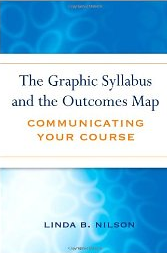 We discussed this book by Linda B. Nilson: The Graphic Syllabus and the Outcomes Map: Communicating Your Course. Click here for a related article about the graphic syllabus. Click here to view Dr. Nilson’s handouts that talk about the graphic syllabus. Oct 9 How can I create effective mini-lectures? If you missed this Brown Bag Faculty Dialogue, you can still view the video and take advantage of the supplemental materials. To access the 20-Minute Mentor video “How can I create effective mini-lectures?” go to my.cuw.edu and look for the CELT channel under the faculty tab. The power point slides, transcript and supplemental resources are also there. One of the handouts is about effective discussion that also applies to classroom face-to-face discussions. Here’s a link to a 9-minute YouTube video that describes Presentation Zen, mentioned during Dr. Price’s presentation. Oct 7 Teaching Through Simulation: Brownies, Starbursts, and Much More! Presented by 2013 Faculty Laureate Dr. Jeff Walz. Click here to view the archived presentation. Bromley, Pat. 2013. “Active Learning Strategies for Diverse Learning Styles: Simulations Are Only One Method.” PS: Political Science and Politics 46 (4): 818-822. Raymond, Chad, and Simon Usherwood. 2013. “Assessment in Simulations.” Journal of Political Science Education 9: 157-167.